We understand the importance of a positive dental care experience as children embark on the road to life-long oral health. Our team at Discover Dental recognize that while children are not born with a fear of the dentist, they can sometimes fear the unknown. We believe that building a solid relationship early on will create the foundation for many years of happy, beautiful smiles. Providing a playful, relaxing atmosphere for all our pediatric patients, from toddlers to teens, we strive to remove the anxiety from going to the dentist. Experienced and friendly, we teach the importance of regular dental care and oral health in a way kids can relate to, using non-frightening, simple words to describe each treatment. While parents enjoy a latte and free WI-FI, kids love exploring our hidden playroom, stocked with video games, TV, books and more! 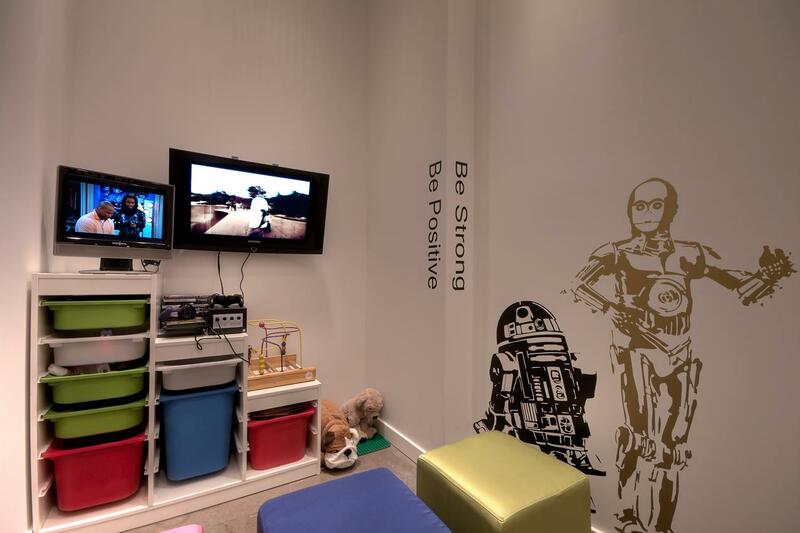 Our treatment rooms feature large, overhead flat-screen TVs and cozy blankets, and if your child needs a little extra help relaxing, nitrous oxide sedation (laughing gas) is available. And because a regular check-up is only one part of the dental care picture, we can help you make dental hygiene an easy, comfortable part of your home routine, from caring for your infant’s first tooth to teaching older children proper brushing and flossing techniques. Our team provides all of our services using the latest methods, materials and a gentle touch. We are a truly patient-oriented practice, and will go out of our way to provide a wonderful dental experience. Our goals are to help you attain optimal oral health and to surpass your expectations for great service. Come visit us today!